The surviving members of the iconic and influential British comedy troupe Monty Python recently closed out their run of reunion shows by bidding farewell in a befitting way: a sing-along of their tongue-in-cheek ditty "Always Look on the Bright Side of Life." The comedians dressed in white suit jackets, with four conducting the London audience with batons as the song's writer, Eric Idle, played guitar. By the end of the song, a number of other performers from throughout the night, as well as Mike Myers, came out to wish the band well before they took their final bow and a screen displayed, "Monty Python, 1969 – 2014." 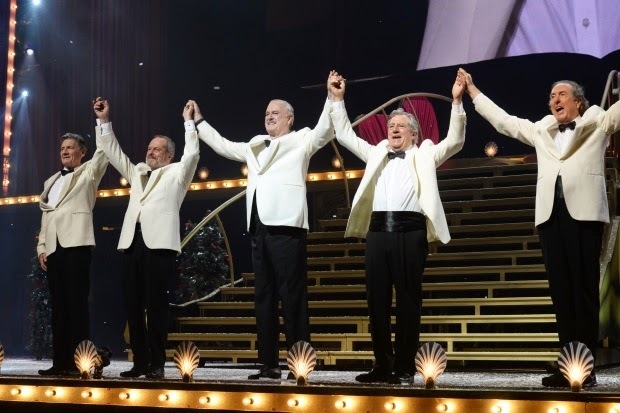 The group, which included Idle, John Cleese, Terry Jones, Michael Palin and Terry Gilliam (fellow founding Python member Graham Chapman died in 1989) had regrouped for a 10-night run of reunion performances at London's 20,000-seat O2 Arena that it smugly dubbed "Monty Python Live (Mostly): One Down, Five to Go." The quintet staged its final show, which its members have said will be the final time they perform together, on July 20th, which it recorded for a live, worldwide theatrical telecast. The group originally premiered the song in its 1979 Bible romp Monty Python's Life of Brian, wherein Idle sang the song from a cross during the crucifixion scene. Most recently, they re-released the song during the World Cup as the "Unofficial England Football Anthem." This past November, the troupe said that in addition to the theatrical telecast, it planned on putting out the final performance as a DVD as well. It has not yet revealed a release date.